Lakes and reservoirs always pose a few problems for anglers. Unlike rivers and streams – or even the coast, where daily low tides allow a fairly easy recce of the fishing grounds – the likely good spots in still waters tend to be much less obvious, and so harder to find. With practice, however, it is possible to glean a lot of useful information about inland lakes and reservoirs, although it does take a bit of time, especially for large expanses of water – but then fishing has never been a recommended activity for anyone seeking instant results! Plants give you some of the most useful clues, particularly when it comes to trying to read a lake. Look for areas where grasses and other land plants overhang the shore – they may hold hordes of fish fry in the summer, and that makes them a ready hunting ground for any resident predators, such as perch and pike. Keep an eye out too for any areas where there’s emergent vegetation, either at the pond margins, or further into the lake. Such patches usually indicate shallower water and often provide feeding places for smaller fish species – and in turn may also be where the bigger fish wait too, for obvious reasons. Reeds, bulrushes and water lily patches are favourite places for a whole range of different species and for the winter pike enthusiast, water lilies have the additional bonus of being a roach magnet in the colder months – and their dormant stems are a perfect place for a pike to hide. Note them in the summer, and you’ll know exactly where to fish later in the year. Since still waters are not subject to flow or tides, the shape of the rest of the landscape can often give you an insight into what the submerged environment will be like. Of course, there are some exceptions; a reservoir formed by damming a valley may still hold the evidence of the current which originally cut it, while entirely artificially constructed lakes may be unnaturally featureless under-water, but for the most part, the surrounding land can at least help. Steep slopes approaching the water suggest that the same thing continues below, while bays and inlets tucked into the margins of the main body of water will normally indicate shallows that may repay a little exploration. By the same token, look out for any bars, banks or spurs that encroach into the water, especially if they’re covered in vegetation – they make good feeding places, and ideal ambush spots. The contours of the lake or reservoir can have a vitally important influence on fish behaviour, and by implication, where to fish. In still waters where there is a large variation of depths, the fish often have to “commute” between resting areas and feeding spots throughout the day. 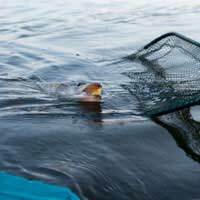 By contrast, in created lakes and bowl-type reservoirs where there is little difference in bottom depth, there is much less pressure on the fish in them to be so nomadic in their habits, and in these conditions, they will often stay within a surprisingly tightly defined area. Clearly, knowing which kind of lake or reservoir you’re dealing with can go a long way towards ensuring your success. You can also get some really useful hints into the lie of any lake or reservoir if you simply remember that, no matter how single-minded an angler you are, fish aren’t the only things that live in them. There are plenty of good clues to be had from the rest of the wildlife for which these bodies of water are home. Watch the water birds in particular, and you’ll get an instant insight into the nature of the place; coots for instance, feed on bottom weed, but they aren’t keen on diving too deeply to get at it. Watch where they dive, and you’ll know where the shallow reaches are to be found. Keep your eye out too for great crested grebes; in the spring, males dive to collect weed for their courtship display – like coots, telling you where it’s not too deep – but come the summer and with young to feed, they’ll be diving where fry are to be found. Try your hook there, and you might just find yourself ideally placed for that big old pike! Look at what the swans are doing too – diving simply isn’t their style, so they can only feed on the weeds that their long necks can reach, which makes them another excellent measure of the water’s depth. There’s undeniably an art to reading lakes and reservoirs, but it’s definitely one worth developing and best of all, once you start to get your eye in to spotting the clues that are there, you’ll wonder why you didn’t see it long ago. Arguably more than any other fishing venue, success with these bodies of water comes down to having an intimate knowledge of them, and usually one built up over years of experience, but even if it’s a once in a lifetime opportunity, if you know what to look for, you’ll give yourself the best possible chance. As for the rest, like most of fishing, it largely comes down to luck!